I love a good bundt. They’re so cool looking. I really want one of those fancy bundt cake pans that look like a castle or a bunch of flowers or something, but for now I must settle for my plain ol’ bundt. Doesn’t matter, though. Plain bundts are just as tasty. And I do believe we’ve stumbled upon my favorite of all the bundt cake recipes in the history of ever. 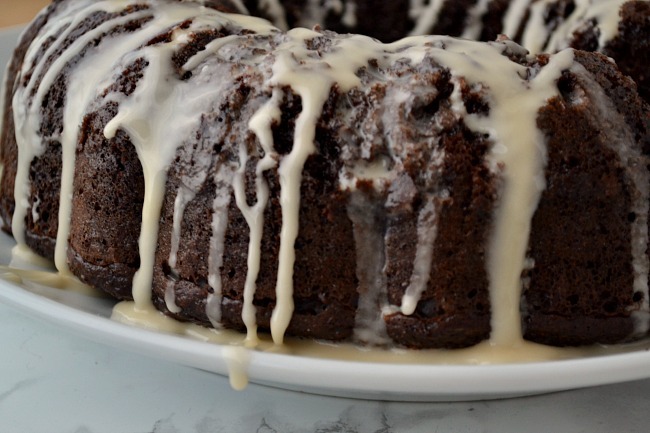 The key, of course, to a great bundt cake recipe, is the glaze, and this one is especially excellent because it’s nice and boozy. The Irish cream gives it just the right kick, and makes it perfect for St. Patrick’s Day. Or…y’know…Tuesday. Irish cream is good any day. This isn’t too fussy of a recipe — the cake part is mostly just a mix, so you can whip it up quickly. Add a few extra things to make it special and boom! You’re done. Make cake mix according to package instructions. Add chocolate chips and bake for the recommended baking time for a bundt cake on the package. In a medium bowl, combine powdered sugar and Irish cream and mix. Continue to add liquid until you have the right consistency for glaze. Drizzle glaze over the bundt cake and serve.